Fan voting to select the finalists for the 2011 Paul Hornung Award is open on Facebook and being powered by Texas Roadhouse and the Louisville Sports Commission. Fans can vote once a day by going to www.votepaulhornung.com. 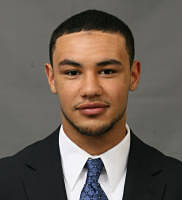 Toledo junior wide receiver Eric Page is on the ballot. Page is among the leaders in the nation in receiving, as well as kickoff and punt returns. He also has completed four passes in his career. The Paul Hornung Award, presented by Texas Roadhouse, is awarded annually to the most versatile player in major college football. 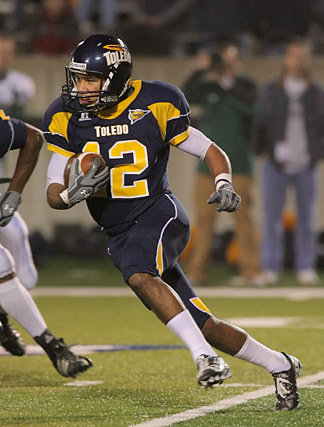 College football fans nationwide will have the opportunity to vote for players on the 2011 watch list and any player who has been named to the Paul Hornung Award Weekly Honor Roll. Results of the fans’ selection on Facebook will count for one vote, adding to the votes cast by the 16-member Selection Committee. Fans also will have the chance to vote for the winner from among the finalists in a second round of voting starting Friday, Dec. 9. The Louisville Sports Commission launched the Paul Hornung Award in 2010 to honor its namesake and native son to promote outstanding performances by multi-talented college football players who often go unnoticed. Senior Dugan Murphy has earned Mid-American Conference Golfer of the Week honors, the league office announced yesterday. It is the first time in his collegiate career that he has received this honor. The Okemos, Mich., native won the first tournament of his collegiate career Sept. 27 when he carded a career-best five-under par 66 to win the rain-shortened Inverness Intercollegiate. Murphy, who began play at the 11th hole, birdied three of his first eight holes before stringing together seven straight pars. Birdies on the par-five No. 8 and par-four No. 9 holes secured his first tournament win as a collegian. 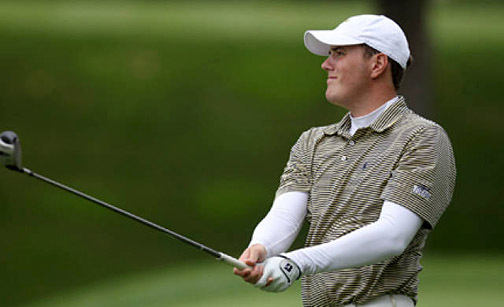 With his performance at the Inverness Intercollegiate, Murphy is now the No. 1-ranked player in the country according to Golfstat.com and Golfweek.com. Toledo will return to action Monday and Tuesday, Oct. 11-12, when the Rockets travel to Akron for the Firestone Invitational. Students in medical school know they want to be a physician, but what type of medical specialty they would like to practice can be more difficult to pinpoint. A new multimedia tool developed by medical students and the Office of Student Affairs for the College of Medicine and Life Sciences is a resource to assist students in making that decision. The new resource Medical Career Advising Resources Project, available here, is an education tool to help medical students learn more about the different fields to make informed decisions about their specialties. Medical students on average change their specialty choices up to three times. A mobile version also is available for use on smart phones or tablets, another special component, Tuttle said. The Medical Career Advising Resources Project is another tool to assist medical students in addition to individual advising sessions, group workshops and other services, Metting said. “Career selection is an important part of the maturation process of every medical student and health-care professional in the world. It’s a dynamic process that takes place over a long period of time,” said Dr. Jeffrey P. Gold, chancellor, executive vice president for biosciences and health affairs, and dean of the College of Medicine and Life Sciences. Gold, who provides the introductory video interview for the website, notes there are many facets involved in making the career decision, such as employment opportunities in a specialty, family plans, interest in research and more. “I assure you that as time goes on, the natural process will evolve, your wishes and your desires, your competitiveness, your aspirations and that of your family, will all be successfully woven together into a highly successful fabric that will not only get you off into a wonderful track of graduate medical education, but that will produce a highly satisfying and successful career,” Gold tells students through the website. The Medical Career Advising Resources Project resource will continue to grow and evolve to assist students with more information. A link at the bottom of the page allows medical students to comment on the site and help make it better. Alice M. Batchelder, chief judge of the United States Court of Appeals for the Sixth Circuit, will deliver the Stranahan Lecture for The University of Toledo College of Law at noon Thursday, Oct. 6, in the Law Center Auditorium. During the state ratification debates over the Constitution, the Anti-Federalists warned that the federal government would not consist of three co-equal branches; instead, they predicted that the federal judiciary would become the dominant power. Batchelder will discuss whether the Anti-Federalists’ prediction has come true. She has been a member of the U.S. Court of Appeals for the Sixth Circuit since 1992. Before that, Batchelder was a U.S. district judge and a U.S. bankruptcy judge. The Stranahan National Issues Forum is a joint program of The University of Toledo College of Law and its chapter of the Federalist Society for Law and Public Policy Studies. It is made possible by an endowment from the Stranahan Foundation. Batchelder joins a long list of high-profile speakers who have delivered the Stranahan Lecture at the College of Law. Reserved parking for lecture attendees is available in Lot 25, which is adjacent to Rocket Hall. The University of Toledo’s Office of Accessibility has partnered with Atomic Learning to provide access to a timesaving resource to address adaptive software training and the creation of accessible instructional materials. UT students, faculty and staff now have access to how-to tutorials on more than 60 adaptive software programs. Atomic Learning’s online training offers a library of short, easy-to-understand tutorial videos, and addresses “How do I apply that?” challenges through structured projects and workshops. Atomic Learning breaks down each application into manageable tasks, explaining each with step-by-step visual instructions. Users can view a tutorial when they have a quick question about a program they are using, or can view a series of tutorials and master an entire application. The UT community can access this training suite by visiting the Office of Accessibility website, clicking on “adaptive software tutorials,” and logging in with their UT username and password. “The Learning Collaborative is dedicated to providing the highest quality services to enhance and support the academic journey, and the Office of Accessibility exemplifies that dedication. The Atomic Learning tutorials are just another example of our mission in action,” Paprocki said. Atomic Learning is an online technology training and professional development tool for educators. Founded in 2000 by a group of technology educators, it serves more than eight million individuals in more than 40 countries worldwide. Atomic Learning’s stated mission is to provide educational resources that allow educators, students and learners of all ages to embrace technology. The Office of Accessibility supports persons with disabilities as they develop their academic and personal potential within the University community. As the bridge to integration within the University, the Office of Accessibility advocates for students’ rights; promotes awareness of disability issues; and ensures equal access to University programs, activities and facilities. The Office of Accessibility is part of the UT Learning Collaborative that works to support and enhance the academic journey. The Ohio Lake Erie Commission presented the 2011 Ohio Lake Erie Award to The University of Toledo Lake Erie Center in recognition of its stewardship and preservation of the lake. 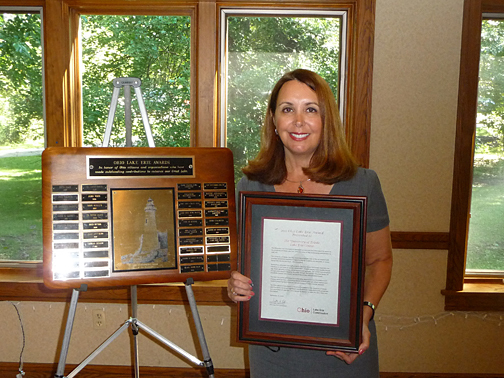 Dr. Carol Stepien accepted the 2011 Ohio Lake Erie Award presented to the UT Lake Erie Center. Dr. Carol Stepien, UT professor of ecology and director of the Lake Erie Center, accepted the award Sept. 15 from Scott Zody, interim director of the Ohio Department of Natural Resources and chair of the Ohio Lake Erie Commission. “The award is a huge honor for the UT Lake Erie Center and is a tribute to all the hard work of every person involved,” Stepien said. The Ohio Lake Erie Award is presented each year to an organization that has made exceptional contributions to enhance Ohio’s Great Lake. The Lake Erie Center, located in the northwest corner of Maumee Bay State Park, is a research and education center focused on environmental problems in the Great Lakes freshwater ecosystem. 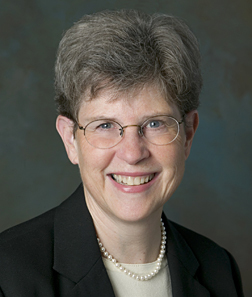 Dr. Nina McClelland, University of Toledo dean emerita, was honored last month by the American Chemical Society (ACS) and selected to its 2011 class of Fellows. McClelland served in multiple roles at ACS, including as chair of the board of directors. At the Fellows ceremony in Denver, ACS leaders and chemistry professionals spoke about their professional experiences working with her and the friendships that resulted. McClelland has been highly successful in the business world, spending more than 30 years with NSF International, an independent, not-for-profit organization dedicated to certifying products and writing standards for food, water and consumer goods. She served as chair of the board of directors and executive committee, and president and chief executive officer. In 1995, McClelland started her own consulting firm. In 2008, UT asked McClelland to serve as dean of the College of Arts and Sciences, a role she held through 2010 when she was elevated to work in the Provost’s Office until her retirement in 2011. A two-time graduate of The University of Toledo, McClelland earned bachelor and master of science degrees in 1951 and 1963, respectively. She received her doctoral degree in environmental chemistry from the University of Michigan in 1968. 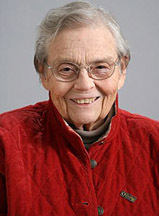 UT awarded her an honorary doctorate in science in 2003. Senior Dugan Murphy captured the Inverness Intercollegiate title Tuesday with a career-low 66 to help Toledo post a third-place team showing. Originally scheduled for 54 holes, the event was shortened to 18 holes after heavy rains Monday left the par-71, 7,255-yard course unplayable. 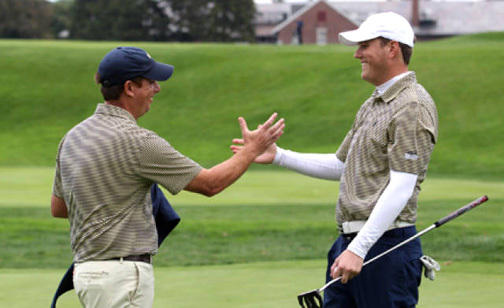 Toledo Head Men's Golf Coach Jamie Mauntler, left, congratulated Dugan Murphy for winning the Inverness Collegiate. Murphy, who began play today at the 11th hole, birdied three of his first eight holes before stringing together seven straight pars. Birdies on the par-five No. 8 and par-four No. 9 holes secured his first tournament win as a collegian. The next closest individuals were Kent State’s Taylor Pendrith and Florida’s TJ Vogel, who tied for second place at one-under par 71. The Golden Flashes captured the team title at three-over par 287, four strokes in front of second-place Liberty (291) and five ahead of the Rockets. UT’s third-place finish was its best in the eight-year history of the tournament. Freshman Jamie Richardson also produced a solid outing for the Rockets, posting a three-over par 74 to tie for 17th place. After bogeying his first two holes, he parred all but one of his remaining 16 holes. Freshman Chris Selfridge tied for 25th place at four-over par 75 and played his final 12 holes at one-over par. Rounding out the Rockets’ lineup were senior Michael Cermak tied for 39th place at six-over par 77 and freshman Mike Lancaster tied for 65th place at 10-over par 81. Also competing for Toledo as individuals were freshman Patrick Cermak (T-46th/78), sophomore Oliver Holtsberry (T-54th/79), senior Matt Fuller (T-65th/81) and redshirt freshman Nate Gonring (69th/82). For the second time this season, junior wide receiver Eric Page has been named to the Paul Hornung Award Weekly Honor Roll. The weekly recognition honors versatile, single-game performances around the nation by Football Bowl Subdivision student-athletes. While controversy surrounded the Rockets’ 33-30 overtime loss to Syracuse, there was no questioning Page’s performance. He caught 13 receptions for 158 yards, returned one punt for seven yards, and ran back five kicks for 114 yards. He finished with 279 all-purpose yards. Page passed Steve Odom (216 catches for 2,631 yards, 2003-2006) to move into second place in school history with 219 career receptions for 2,696 yards. In addition, Page was named the Mid-American Conference West Division Co-Offensive Player of the Week. 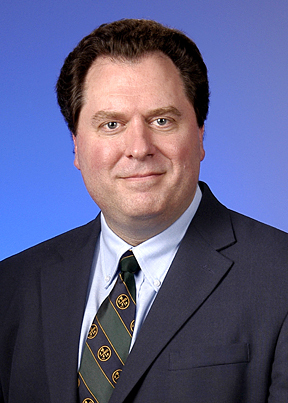 A Health-Care Hero is leading The University of Toledo’s Center for Neurological Health. Dr. Lawrence Elmer, UT professor of neurology and director of the Center of Neurological Health and the Parkinson’s Disease and Movement Disorders Program, recently was honored as a Health-Care Hero by the Hospital Council of Northwest Ohio at the third annual Health-Care Heroes recognition ceremony held this summer at the Toledo Museum of Art Glass Pavilion. Health-Care Heroes was started in 2008 to recognize health-care professionals who are making a significant impact in the health-care industry and on the quality of life in their community. The honor goes to individuals who are not motivated by praise, recognition or job advancement, but those who desire to make a difference in the lives they touch. Elmer, who has spent the last 13 years at The University of Toledo Medical Center, researches the most promising medications for Parkinson’s disease. Many of these investigational treatments have been found effective and have become available medicines for adults living with Parkinson’s. “I wish I had a magic wand to take it away, but we have the next best thing. We can do our best to make Parkinson’s as insignificant as possible in the lives of people with Parkinson’s disease,” Elmer said. Elmer helped create the annual Northwest Ohio Parkinson’s Disease Symposium to inspire and educate patients, caregivers, students and health professionals dealing with Parkinson’s. In its first year, the symposium drew less than 200 people; now in its 14th year, it has grown to 600 attendees, making it the second largest annual Parkinson’s symposium in the nation. “In the old days of the symposium when we did not have as many medications to help, it was easy to tell who had Parkinson’s. Now the attendees have to go around their tables and ask who has Parkinson’s disease and who doesn’t. That means what we are doing treatment-wise seems to be working,” Elmer said. He also has been able to help those struggling to pay medical expenses by establishing his own patient assistance program in the Neurology Department that has assisted hundreds of patients who need medication but are unable to afford it. This program annually dispenses more than $250,000 in free medications supplied by pharmaceutical companies. Elmer, who was nominated for this award by the daughter of one of his patients, was one of five Health-Care Heroes selected out of 55 candidates. “It is very humbling to hear of the other heroes’ achievements and to be awarded as a part of that group,” Elmer said.